To be honest I just scaned the whole thread quickly, but what is the current state of this GB / IC? Still in discussion and the actual GB will happen whenever it ... well... will happen? Or did I already miss it? wodan is waiting for another quote from GMK. Damn. Nice keyboard. And what is it with those Wodan build vids? Why do I enjoy watching them? And why do others? Anyway: thanks for the answer! Patience wins at the end, always. ideus wrote: ↑ Patience wins at the end, always. +1, those were not really mythical but actual ripoff that took off real money for poor candid participants. what are you talking about? you're making me curious! would you please be so kind and tell a guy with little keyboard-community history like me which GB you're talking about? Probably some scam GBs on Geekhack, where the leader got MIA with all the money. Right! First things first, the comment is totally of out of place here, as Mr. Wodan is a trustworthy fellow. It was just a reference to some failed GBs and sells that happened at GH, last year. we were talking about some guys who vanish out of thin air on GH, yes! What's the status? Still waiting for prices? Put myself on a budget now with the goal of getting the funds for HADapter II together soon but had some unexpected expenses lately and another quarterly tax payment coming up which currently tie my hands. No worries, we can always wait, no hurries, either. Three split kits for me please. But wait, the GB is not open yet? LOL. The 2.75 long right shift is not included in the adapter kit, because it is common in HAD and most ANSI sets. The blank key in the space bar kit is exactly the same profile but with no legends, still, it is an alternative replacement, meanwhile you get the right thing. Ok thanks. Maybe my best bet is to hunt for a set from a "vintage" G80-3000 or in the interim a blank set of modifiers. Your keycaps are apparently lasered though, if so doubleshot ones will look pretty different. 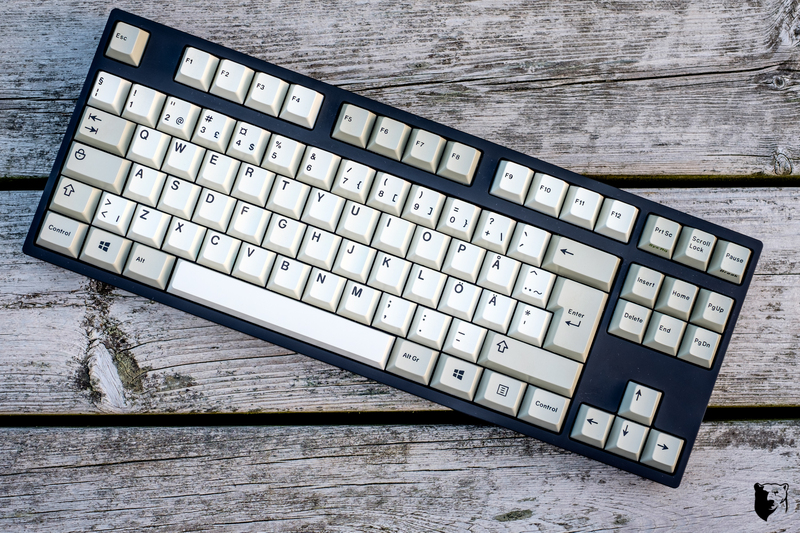 Maybe one day ill find a ISO Swedish set tht are doubleshot, I can live in hope. I guess I might as well get a dremmel out and start trying to modify the R4 keycaps in the meantime. Join the GMK beige/white international kit https://geekhack.org/index.php?topic=92140 ! funkden wrote: ↑ Maybe one day ill find a ISO Swedish set tht are doubleshot, I can live in hope. I guess I might as well get a dremmel out and start trying to modify the R4 keycaps in the meantime. Finding Cherry HAO keycaps is a difficult task. Given their apparent rarity, luck is your best bet. From the time I started looking for these until I had them in hand was a little while (featuring the first round of hadapter, btw). So, for the sake of your sanity, I'd recommend you do like t8c says and buy the international kit. Beige Cherry keycaps are relatively easy to find. Swedish legends, however, are not. Damn Khers, that looks fantastic. I swear, you people with photography skills manage to make these boards look better than in real life somehow. Oh yeah sorry for the lack of updates, i should post this in the OP. I‘m currently too busy with RL stuff and other keyboard side projects to give this GB the attention it would require. We‘ve all seen half assed GBs and I will not deliver a bad performance. There‘s been the 9009v2 GB recently which probably helped some of you get some missing key and I will reconsider some of the kits here based on the 9009 GB when it‘s time to pick this up again. Currently I am expecting 100+ keyboards from Cindy for EU distribution so this will keep me beyond busy for a while! scottc wrote: ↑ Damn Khers, that looks fantastic. I swear, you people with photography skills manage to make these boards look better than in real life somehow. It's not the photography skills, it's the expensive photography gear. Or was it the other way around? I forgot. I guess I be bidding against you on Tradera then when a set come up eh? Where did you get yours btw?